ZeniMax scooped up all of the questions that fans had after seeing The Elder Scrolls Online’s crafting and exploration video, and answered several of the most pressing of them in a new post. TESO will feature five crafting professions: weaponsmith, armorsmith, enchanter, alchemist, and provisioner. Of these, players are able to train in two fields so that a robust economy will develop between crafters. While there aren’t any recipes in the game, players have multiple avenues to combine ingredients and make the same item. 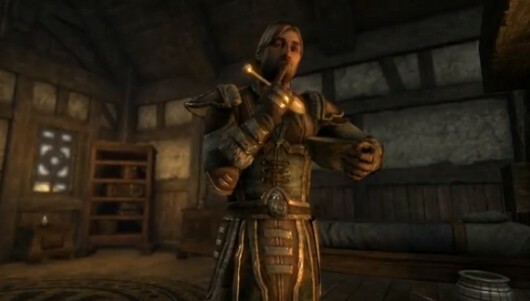 The studio indicated that those who have played previous Elder Scrolls games might have an advantage in knowing familiar plants and crafting ingredients and how they interact. Other topics in the AMA include fishing lures, how big your library can get (there’s no limit, basically), the use of Mundus Stones, and the difficulty of lockpicking. “Your lockpicking will automatically improve as you level, gradually making chests that were once very difficult to open a much easier prospect. Though your lockpicking skill will increase as you level, the chests you encounter in higher level areas will also be more difficult,” ZeniMax explained. I hope exp isn’t given for crafted items, why your thinking? well IMO it’s not world emerssion, 2 it stops the progression to a character and people like this buy gold from bot/hack sites, finally there’s no faction/guild contribution… I play mmos to mingle and progress with players and hate the fact that like wow a farming bot can max lvl a character… Anyone who uses these programs need perma ip bans… also preying that ZO implement harsh penalties to anyone looking to exploit there game. I highly doubt being able to make 2/5 of the items, compared to 1/5 of the items comes out as strengthening for the economy. Why can’t they just have 1 profession per character (when they only have 5 in total)? You would earn a greater profit if there is greater demand (because not everyone can craft the same items ).